Picture this, You have been trapped inside a metal tube for 13, 15, 22 hours with your knees wrapped around your ears. The tube lands and disgorges you into an airport. Some airports give you a great welcome to that country and some make you think you are in some sort of on going hell. Here is my list of best and worst airports. Singapore (SIN)- take a shopping mall, throw in a waterfall or two, add the most efficient processes for everything from customs to luggage retrieval (challenge you to try and beat your baggage) to taxis and add a layer of calm and you create the magic of this amazing airport. Delayed? Go and get a massage. Los Angeles (LAX)- the only thing I like about this airport is the themed restaurant. It is the world's sixth biggest in terms of passenger numbers. That is no excuse for the surly service, leaking cracking infrastructure and long lines for anything. Add the fact that the transit line to downtown ends a couple of miles away from the airport! It is the worst entry point for visitors to the USA and does nothing to enhance the image of the USA. JFK- urgh. Jetblue's terminal is amazingly wonderful though. I just need to get to Incheon! Did you mean AKD or AKL? Never been to AKD (Akola) so can't comment. AKL - Auckland is an okay airport for me (just over 3 put of 5). I have used it 56 times! I think it is getting better. 1. its absurd lack of transport. The decision not to proceed with a rail extension has got to be one of the poorest in a series of poor Auckland decisions re transport. Only one taxi company can pick up at the airport. Shuttle pick up and set down is crazy. And the traffic on the highway into and out of the city is outstandingly bad. 2. the connection between international and domestic. I usually walk the meandering path between the two terminals -its a calming rest. 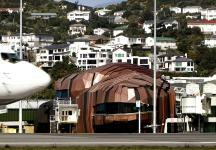 WLG is my fave airport in NZ cos its so exciting but Christchurch is probably the best one.